As part of Sierra Leone's bid to combat Ebola, the entire population of more than six million people was obliged to stay at home for up to three days straight on two occasions during the past year. Officials say the lockdowns - dozens more have also taken place in localised “hot zones” - do much to achieve the government’s goal of reaching zero cases of the Ebola virus, but poor Sierra Leoneans can barely afford to miss several days of vital earnings in a row. “Our aim is to first identify all cases, all people showing signs of illness or fever, and then test them for Ebola or other illness,” said Paolo Conteh, chief executive officer for the National Ebola Response Center (NERC). During the lockdowns, thousands of health workers go door-to-door in search of people showing symptoms of infection. At the same time, teams of “social mobilisers” spread best practice messages about how to prevent infection and what to do when suspected cases arise. During a three-day lockdown in September 2014, when the 10-month outbreak was at its peak, health workers identified some 263 cases of Ebola among 900 people found to be sick. They also found 100 bodies hidden by families in their homes. More recently, at the end of March, another three-day national lockdown led to the discovery of at least 10 new cases. Several dead bodies of suspected Ebola patients were also found. In the Western Area, which includes the capital Freetown, the number of people reporting suspected cases was more than double the average for the previous three weeks combined, following the stay-at-home campaign. “As a whole, the three-day lockdown was a major success in accomplishing the reduction of sick people staying in their houses, refusing to show up [to medical centers for testing],” Conteh said. “At a certain point, it becomes important to take stock of the situation and respond in the most organised way. The core of the response here is identifying the case, isolating them and preventing widespread infection,” he added. 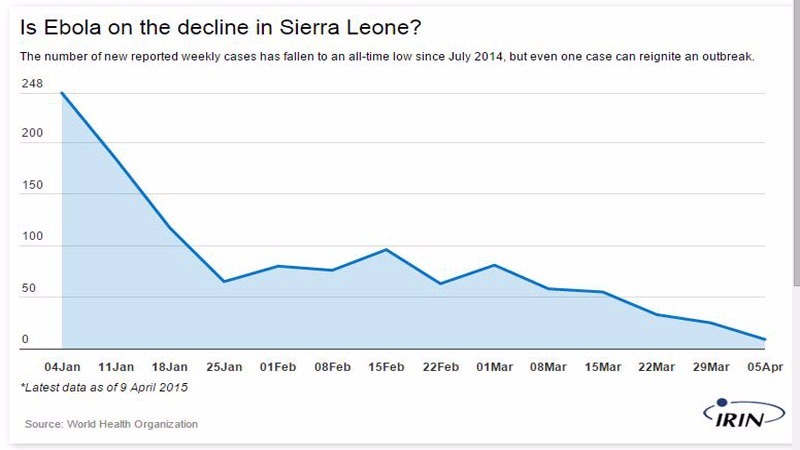 The number of new reported cases in Sierra Leone has decreased sharply over the past three months, from 248 cases a week in early January to just nine reported cases in the week ending 5 April. This is the lowest weekly figure in almost a year, according to the World Health Organization (WHO). In the week leading up to the lockdown, two-thirds of the cases were identified by tracing people who had been in contact with other known sufferers. That a third were not found through contact-tracing indicates that there are a significant number of people in Sierra Leone infected with Ebola whose identities are unknown to the authorities. “We hope that the social mobilisation conducted as part of this [stay-at-home] campaign will help to overcome some of the complacency that has crept in as Ebola cases in Sierra Leone decrease,” said Yann Libessart, West Africa regional communications coordinator for Médecins Sans Frontières, one of the most active NGOs fighting Ebola in West Africa. “Although cases have reduced since the peak, the outbreak is certainly still not over. It is critical that any cases identified through this campaign, and at any other time, receive prompt isolation and supportive treatment, and that all their contacts are traced quickly and effectively,” he added. But the lockdowns, especially the initial ones, have been met with a lot of resistance by communities. Some international NGOs have criticised the government’s approach, saying the stay-at-homes, which are enforced with the threat of fines or potentially even jail terms, can cause unnecessary panic and lead to risky behaviour. The stay-at-homes also affect people’s livelihoods. “Three days of staying at home is hard on many families here who live hand-to-mouth on a daily basis,” said Winnie Romeril, a WHO spokesperson in Sierra Leone. Mabinty Kanu, for example, a 30-year-old widowed mother of three, normally sits along Freetown’s busy Siaka Stevens Street, selling groundnuts each day to passersby. During the lockdown, she was unable to go to work. Mohamed Bangura, who sells chili peppers at Freetown’s Guard Street open market, recognised that the lockdowns were a necessary hardship. “I’m in support of the lockdowns to end the spread of the virus,” he said. “But each time there’s a lockdown it affects sales because it’s only at the start of the weekend that we normally have huge sales. The Sierra Leone Red Cross Society, which provided social mobilisers during the last lockdown, told IRIN that is vital that adequate water and food supplies are provided to people in such situations. But many Sierra Leoneans, particularly in slum areas, reported having little to no access to food or water during the lockdowns. The World Food Programme and other agencies have delivered food aid to some homes but cannot reach everyone. Despite promises by the Ministry of Health to deliver food and water to certain households during the latest stay-at-home, the UN Mission for Ebola Emergency Response (UNMEER) said there were a number of reports of delayed or missing distributions. This led some people to violate the stay-at-homes and go out in search of basic necessities. “I’ll always obey the laws of my country,” said Sally Kamara, a fishmonger at the Funkia Fishing Village market in Freetown. Kamara said she normally earns around $28 in profit each weekend. During lockdowns, she earns nothing at all.